Unfortunately, this morning we realised we were running short of LPG (gas), and as places that have it are a bit few and far between in this area we needed to make a 60 mile there and back detour to go and get some - and that was on top of what would already have been a long day to get into the vicinity of Preikestolen (Pulpit Rock). But we had no choice because our only other option would have been to whizz down to Kristiansand, and by doing that we'd have missed an awful lot of Norway out altogether. Happily, when we got to our destination we not only got the gas but also equipment (for just £9) to temporarily fix our poorly wing mirror! Once back to where we started from we followed the E134 through many many miles of mountainous and forested road - it was pretty, but also pretty boring! And it also left a lot to be desired in what our tyres were rolling over, however there were huge areas of repair and renewal going on so at some stage in the future it will be a good road. 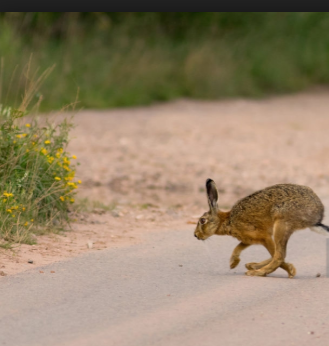 And today we only had one 'hare' raising experience - the poor creature shot out in front of us and didn't know which way to run to get away from the huge white box that was rapidly baring down on it - but it didn't end up in our pot!! We ended our day still on the E134 and just on the border of Hardangervidda National Park in a beautiful free spot by a lake and surrounded by more moraine. Tomorrow we'll finish off the miles that we'd originally planned to do today but I doubt we'll get there in time to do our planned hike - that is now likely to have to wait till Monday! This morning as we left the Vest-Telemark area behind we plunged into another day of many tunnels - we passed through 42 with a total distance of about 18 miles!! And at the start of our journey when we weren't in tunnels the main arterial E134 either clung to steep mountain sides or dived through deep valleys that were partially filled with glacial lakes. The road isn't identified as a scenic route but this section was at least as good as some of those we've already travelled - so in our opinion it probably should have been. However, today's itinerary did include part of a Scenic Route and that was the Ryfylke - Route 13. We joined it at Hara but it actually starts at quite a bit before that at Hordalia from where it runs 183 kms to Oanes, which is where we'll eventually leave it tomorrow. To start with the road (and in other places along it's course) was another narrow one that had my adrenaline pumping as we twisted and turned around blind bends and climbed up and down steep slopes with rugged brutal, unyielding rock faces on one side and low concrete or metal barriers on the other! But in the beauty department today's journey presented loads of contrasts as we passed through more deep gorges and valleys, along with sheer mountains or lush green hillsides from where many mountain streams and waterfalls gushed into churning rivers where white water was more common than smooth. There were also lots of bigger bodies of water with either unpronounceable or unidentifiable names, but they were all very lovely - it was just a shame that for most of the time John daren't look! At the small settlement of Nesvik we caught another ferry over the Boknafjorden to Hjelmelands and then continued along the Ryfylke to today's destination which was in a marina in the town of Tau - another lovely stopping place with the view below right from our door! Well, it might have taken a couple more days than planned, but today we finally made it to Pulpit Rock - or to give it it's Norwegian - Preikestolen. 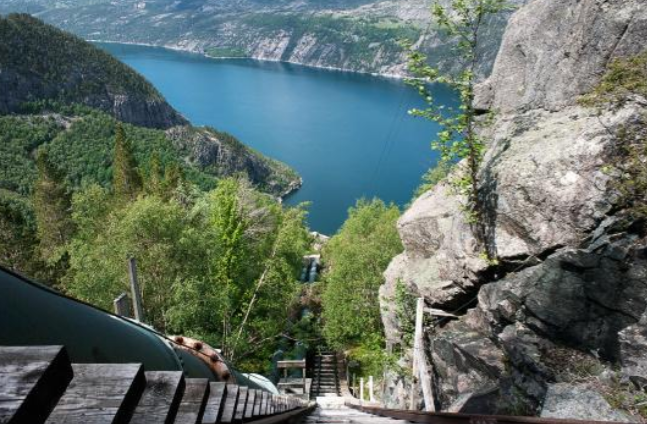 Apparently it's one of the most visited natural attractions in Norway and 200,000 people make the trek each year, but when you consider it can only be done in the between April and October that's a lot of people each day! And this was attested to when we arrived at 10.30ish, because the main car park was already full, we were required to park about a kilometre further down the hill in the over spill parking area - and for the pleasure of doing that we were charged 200 Nok (£19)! So with picnic packed we set off on our 15 kilometre hike, which was mostly in an upwards direction, with the trail taking us over rough rocky 'stairways' and ledges and over lots of moraine. The walk is classified as a Red one so we were fully expecting it to be quite tough, but it was made more so because of the huge numbers of people who where progressing either one way or the other, and there were also several very steep bottlenecks where some individuals were struggling while others were too impatient to wait. 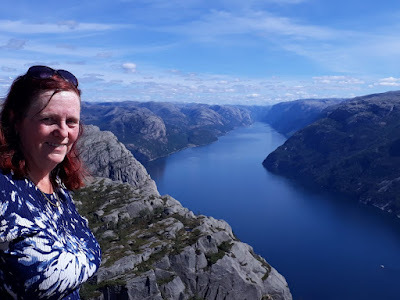 However, having said that it was a fantastic walk and when we finally got to the top which lies 604 metres above Lysefjord the views were amazing, and the only draw back there was the huge number of people who were occupying the 25 metre square plateau. But we jostled and got our pictures and also took the time to admire the stunning views of Lysefjorden (which means light fjord) which is 26 miles long and derived it's name from the lightly coloured granite rocks along its sides. 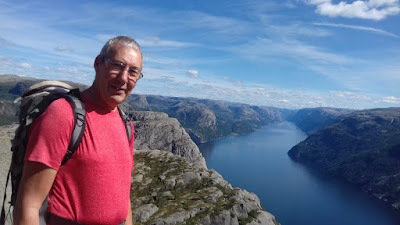 Then, rather than eat with the masses we descended a short way and munched our sarnies with our legs dangling over the mountain side and still with views of Preikestolen, Lysefjord and also a long waterfall that was plunging down the cliff that was opposite to us. We completed our walk is just under 5 hours, so for saying we're a bit out of practice with long hard hikes we thought we'd done quite well - but we were both knackered by the time we got home. Therefore, I don't think we're going to bother with the other walk in this area that I'd read about. 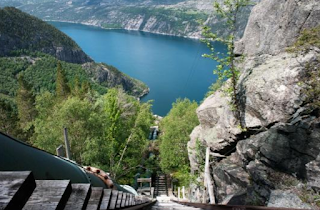 It's called Florli 4,444 and that's because it 'runs' up what is supposed to be the longest wooden staircase in the World - a total of 4,444 steps that start at the edge of the fjord and climb up the mountain to an old power station house! It almost killed me when we climbed up 418 steps to Mount Aksla so I think we'd be biting a bit more of than we can chew if we attempt 4,026 more 😧😧! Our View on the way down. Once we'd clambered our way back down we had much needed cuppa before setting of back to Tau to refuel with cheap diesel (13.49 Nok) (£1.26/litre) and restock our food cupboards before driving a few more miles to the ferry port at Oanes to catch what we think will be our last Norwegian ferry tomorrow. This morning our first job was to hop on to what we hope will be our last Norwegian ferry and that was almost directly from our parking place at Oanes over to Lauvik. Our overnight parking spot with our ferry in the distance. And from there our first destination was for another hike up Dalesnuten which is a much less iconic place than Pulpit Rock but equally if not more beautiful, and much more enjoyable because it was 100% less populated. That was an easy bit! The climb up was steep, rough and in places quite technical requiring the use of all 4 paws to either to 'hoik' myself up onto high shelves in the rock face or to stop myself from falling off altogether - as usual John just breezed up but he's got longer legs than me! 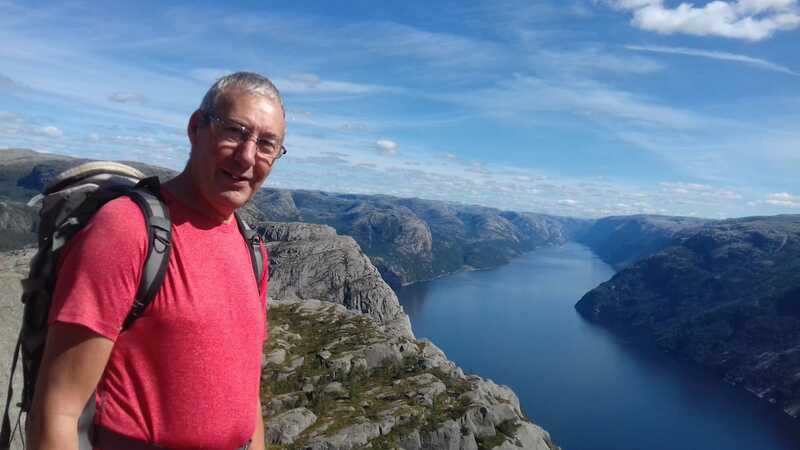 However, as long as I took my time, and with one or two pulls or shoves from John we both made it safely to the top where we were rewarded by 360 degree views over both Stavanger and Sandnes, as well as the mountainous area facing east. At the top we had a very leisurely picnic lunch, and while we scoffed that we discussed how this place had provided some of the most scenic views in the whole of Norway - it would definitely be on our recommendation list, and as it's off the tourist route it's somewhere that can be enjoyed along with much peace and tranquillity. However, all good things come to an end so eventually we scrambled back down and then proceeded on to our next destination which was Rogaland Arboretum. This particular Arboretum is Norway's largest and covers 175 acres with 15 km of walking paths amongst 1400 different varieties of trees and bushes. But after our long walks of the last 2 days there was no way we were ever going to explore it all - we just satisfied ourselves with an hour or so's stroll while concentrating on not getting lost in it's maze like interior.